Jun 18, 2012 • NASA’s Earth-observing fleet of satellites provides a worldwide and unbiased view with standardized scientific data—information crucial for tracking the health of the world’s forests. Countries like Brazil are using data from NASA satellites to track and measure their forests in advance of a United Nations effort to reduce climate change by providing “carbon credits” for protected land. The concept is known as REDD+, which stands for Reducing Emissions from Deforestation and Forest Degradation. 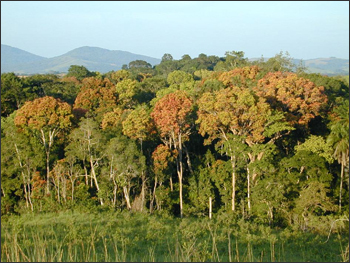 It includes monitoring forest degradation and efforts in conservation and sustainable management. REDD+ will be a major topic of discussion during this week’s Conference on Sustainable Development, known as Rio+20. Images and data acquired by Landsat satellites are increasingly becoming an accepted approach for anyone hoping to have a long-term view of the health of the world’s forests. “For example Brazil is using Landsat data from 1996 to 2005 to create a baseline for tracking future forest coverage,” says Doug Morton, a NASA Landsat researcher at the NASA’s Goddard Space Flight Center in Greenbelt, Md. Consistently gathering data about our planet since 1972, the Landsat Program is a series of Earth observing satellite missions jointly managed by NASA and the U.S. Geological Survey (USGS). Landsat’s views of Earth are at a 30 by 30 meter (32.8 yard) resolution, about the size of a baseball diamond. “That’s a pretty appropriate scale for doing country-wide estimates of forest change,” Morton says. Forest monitoring activities in developing countries heavily depend on guaranteed continuity and freely and open access to satellite data, says Inge Jonckheere of the UN-REDD Programme at the Food and Agriculture Organization of the U.N. in Rome, Italy. “The ability of governments or other organizations to freely access all this data is one of the factors that’s led to a major drop in deforestation in the last ten years,” Morton says. In the 1990s deforestation caused nearly 20 percent of the world’s greenhouse gas emissions, but in 2009 Morton and his research team reported that that number went down to 12 percent. Morton concedes that part of that change is due to an increase in all emissions due to expanded fossil fuels use. “But the rise of satellite-based monitoring is also a factor.” Morton says. “It provided a way for governments and conservation groups to monitor new laws protecting forests and track changes made by major agricultural industries like palm oil plantations and soybean farmers. “Data from satellites like Landsat have really changed the dynamic of deforestation in the last five to 10 years,” he says. The data will continue to flow. Landsat 7 remains in operation 13 years after its launch. The next satellite in the Landsat series, which began in 1972 with the launch of Landsat 1, is scheduled to launch in January 2013 from Vandenberg Air Force Base in Lompoc, Ca. Known as the Landsat Data Continuity Mission (LDCM), it is the eighth satellite in the series and will extend the world’s longest-running satellite program for global land observations. In addition to deforestation and forest recovery, scientists and governments are very interested in quantifying the amount of carbon that is stored as trees and vegetation in forests. “Tropical forests are extremely diverse in species and structure and this diversity impacts their carbon content, an important quantity for estimating emissions from deforestation and degradation” says Sassan Saatchi, a scientist at NASA’s Jet Propulsion Laboratory in Pasadena, Calif. Saatchi and his team created the world’s first map of tropical forest carbon storage using quantitative satellite data in 2011 and found that the Amazon stores most of the carbon in the tropics. Saatchi and his team use data from a suite of NASA satellites to map the forest carbon, including tree height from Geoscience Laser Altimeter System lidar on NASA’s ICESat satellite, imagery from the Moderate Resolution Imaging Spectroradiometer (MODIS) instrument on NASA’s Terra spacecraft, and active microwave data from NASA’s Quick Scatterometer satellite (QuikSCAT) and the Shuttle Radar Topography Mission. The role of the REDD+ mechanism in achieving broader sustainable development goals will be further discussed at the U.N. Rio+20 conference, which takes place from June 20 to 22 in Rio de Janeiro, Brazil.